Through these three surgical techniques we seek to remove the intraocular contents (evisceration), the whole eyeball (enucleation) or the entire orbital contents, including the eyeball (exenteration). The main causes that force us to practice these surgeries are an aggressive tumour, severe infections or inflammatory conditions. Exenteration is performed in cases of tumours that may endanger the patient's life. If the cause is not a tumour, an eyeball is extracted only in cases of absolute blindness (the patient does not even perceive light) and pain or discomfort incompatible with their daily activities. Another motivation would be cosmetic. At the time we do this surgery the orbit becomes an anophthalmic cavity with all the consequences this entails in terms of complications, sequelae and care. As mentioned this technique intraocular HOME_SRC, leaving the sclera (outside what we see as the "white of the eye"), conjunctiva and muscles. 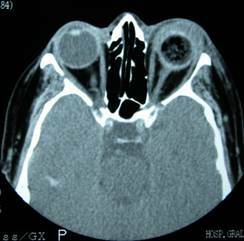 We should avoid urgent extraction of an eye in the event of perforating trauma, no matter how serious the lesions are. 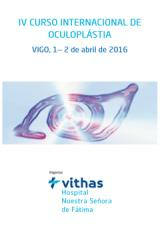 Prior to surgery the patient is explained the type of intervention and alternatives such as use of cosmetic lenses. Although it is a surgery that may scare patients initially, almost all patients are satisfied with the result. Evisceration surgery can be performed under local anesthesia and sedation although general anesthesia is preferable given the psychological aspects involving the extraction of an eyeball. Surgery should be performed by an ophthalmologist specializing in oculoplastic surgery. It is a delicate surgery. We think that the results should be durable, and that some of the future complications can be caused by a technical defect. Evisceration In most used technique is the removal of the cornea and the intraocular contents. This opens the sclera in four parts and introduces the orbital prosthesis. 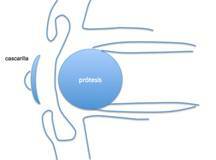 Orbital prostheses trying to replace the spheres intraocular volume. There are different materials, all of nonbiological. The differences lie in its ability to integrate with tissues and offer more movement and fewer infections. Prostheses and some silicone methacrylate are still employed. 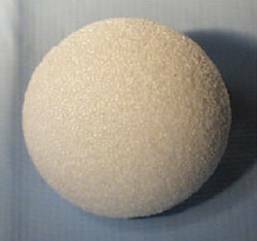 But overall the trend is to use other polymeric spheres with microscopic channels to penetrate therethrough vessels and produce more biointegration. The shape is spherical in most cases. Other shapes have been commercialised in an attempt to improve mobility. Even tutors are designed to be inserted into the prosthesis by way of rods which then fall into the scale. 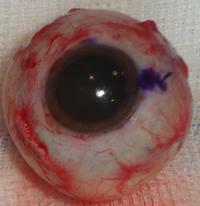 After entering the prosthesis, it comes at the end of the sclera and after the Tenon layer and conjunctiva. Then the patient is left with a plastic shaping. The patient was discharged in 24-48 hours. 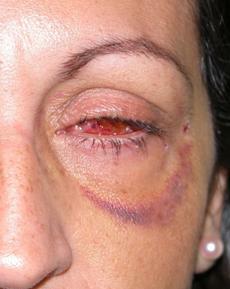 The main complication is eyelid and orbital hematoma. The pain is often more important than enucleation and must be foreseen. Sympathetic ophthalmia: This is an inflammatory disease that affects the healthy eye in those patients who have been subjected to evisceration, especially when the source has been in burns or dirty perforating trauma. There were formerly seen in war wounds. Currently it is very rare, but the patient should know that there is a remote possibility. Sympathetic ophthalmia can be a serious condition even though it is potentially treatable. Sympathetic ophthalmia can occur with evisceration and not enucleation. Despite this, evisceration is usually preferred by ophthalmologists due to the advantages it offers, namely less risk of complications. Subsequent treatment after evisceration is corticosteroid topical treatment and antibiotic ointment and analgesia during one week. Optionally systemic corticosteroids may be added. Patients with diabetes, hypertension or anticoagulant treatments can be operated upon. At 3-4 weeks you will be directed to a prosthetic eye specialist for the carving of the final cosmetic scale. With this technique the entire eyeball and part of the optic nerve are eliminated, preserving the conjunctiva and Tenon and extraocular muscles. 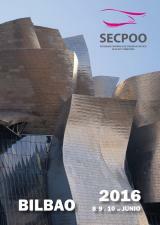 In Spain it is almost always performed due to the presence of intraocular tumours. Ophthalmologists may in some cases prefer evisceration over enucleation, despite the remote possibility of sympathetic ophthalmia, due to fewer complications and less aggressive effect on the orbital tissues. The surgery is performed under general anesthesia and can last an hour or more. After removing the eyeball ab orbital prosthesis is inserted. In this case, unlike evisceration, it is usually covered with donor sclera and reinserted to confer muscle and mobility to the prosthesis. The conjunctiva and Tenon are then closed and surgery is completed. Postoperative evisceration is similar but with slightly less pain. Both enucleation and evisceration share similar secondary complications, see in anophthalmic cavity. In this case we extract the eyeball, muscles, optic nerve and orbital tissues, sometimes including eyelids and eyebrows. This surgery is indicated in aggressive tumours which may potentially endanger the patient's life. Is almost as complicated as posterior exenteration due to the reconstruction effort that must be undertaken. Correction by secondary intention, i.e. let alone the tissues close by themselves. It is a tedious process that can take months. Closure with grafts or flaps of tissue nearby (temporal area) This technique attempts to provide volume and nutrition to the exenterated bone cavity. This surgery is complex but the results are very good. Once the cavity has been reconstructed, the prosthetic screws are flattened by magnets or a mask that simulates the eyeball and eyelids. This surgery requires a prolonged hospital stay, sometimes up to several days.